Stock photo of the Ukrainian Cultural Centre Building in the Exchange District, City of Winnipeg, Manitoba, Canada. Part of the Exchange District in the city of Winnipeg is the Ukrainian Cultural Centre Building. 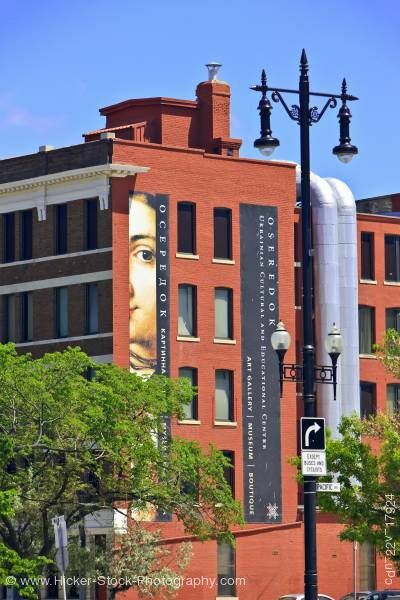 This stock photo shows the Ukrainian Cultural Centre Building in the Exchange District, City of Winnipeg, Manitoba, Canada. The five story red brick building of the Ukrainian Culture Centre displays large advertisements on the side of its wall. The advertisement is four stories long and displays a section of artwork. The artwork shows part of a woman’s face revealing an eye and a small corner of her smile. Dentil molding painted white runs along the top of the windows of the fifth floor. In the foreground of the building is a beautiful ornate black iron lamp post with four lanterns. Trees sit on either side of the lamp post. Clear blue skies add a wonderful contrast to the red bricks of the culture centre. Ukrainian Cultural Centre Building in the Exchange District, City of Winnipeg, Manitoba, Canada.